Carpal tunnel syndrome (CTS) is a condition in which the median nerve is squeezed where it passes through a tunnel in the wrist. This often happens because the tendons in the wrist have become swollen and they press on the nerve. The median nerve controls some of the muscles that move the thumb and it carries information back to the brain about sensations in your thumb and fingers. 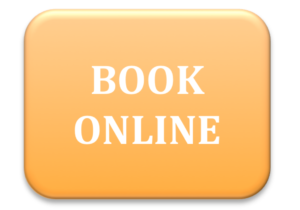 as writing, typing, DIY or housework can bring on symptoms. 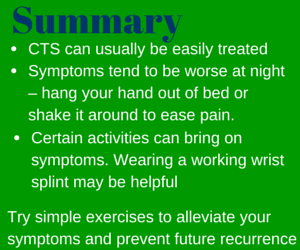 CTS may be associated with pain in the wrist and forearm. 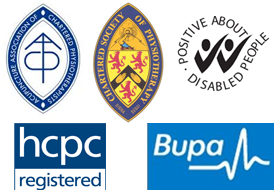 In some cases, nerve conduction tests are needed to confirm the diagnosis. Altered sensation usually tingling in the hand affecting thumb, index and ring fingers. Tingling usually is worse at night disturbing your sleep or first thing in the morning. Hanging your hand out of bed or shaking it around will often relieve the pain and tingling. Provoked by activities involving gripping an object. May experience pain into the wrist and forearm. Wearing a resting splint can help prevent the symptoms occurring at night, or a working splint can be useful if your symptoms are brought on by particular activities. 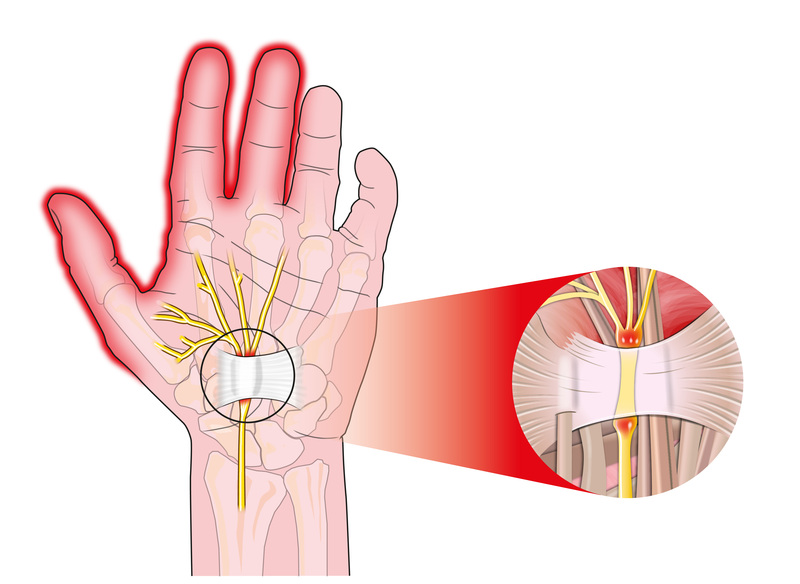 To reduce inflammation, you may have the option of steroid injection into your carpal tunnel. The injection may be uncomfortable, but the effects can last for weeks or months. 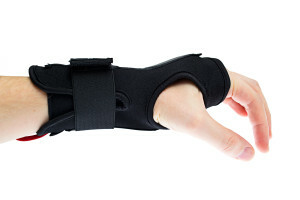 A steroid injection into the wrist joint itself may help if you have arthritis in your wrist. Surgery is frequently required. 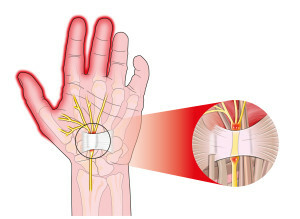 The operation involves opening the roof of the tunnel, which is defined by a ligament to reduce the pressure on the nerve. The outcome is usually a satisfactory resolution of the symptoms. In severe cases, improvement of constant numbness and muscle weakness may be slow or incomplete, but the pain should be greatly reduced. It generally takes about three months to regain full straight, but the hand can be used for light manual handling activities from the day of the surgery. Try simple exercises to alleviate your symptoms and prevent future recurrence. Rest your elbow on a table, arm pointing up, wrist straight. Gently bend your wrist forward at a right angle and hold for 5 seconds. Straighten your wrist. Gently bend it backwards and hold for 5 seconds. Do 3 sets of 10 repetitions. Start with your fingers held out straight. Gently bend the middle joints of your fingers down toward your upper palm and hold for 5 seconds. Do 3 sets of 10 repetitions. Holding a light weight (e.g a tin of beans), stretch your arm out in front with your palm down. Slowly bend your wrist upward, and then return to the starting position. Do 3 sets of 10 repetitions. Gradually increase the weight you hold.